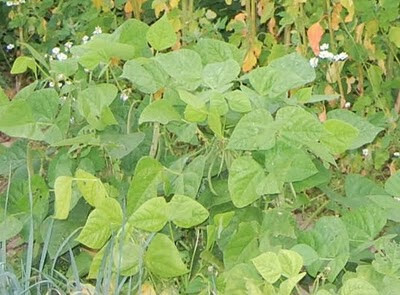 These beans came to me from the Heritage Seed Library last year and as I remember it they were described as the traditional bean of the Channel Islands. Unfortunately I can't find last year's seed list nor is the bean listed anywhere obvious on the HSL webpages so I can't confirm my memory is correct on this. Which is a problem since other researches on the web have turned up nothing about beans of this sort being traditional to Jersey, just that beans and Jersey have a long association - oh, and one of the commercial seed outlets is offering a bean called Jersey but it doesn't look like this one and is being sold for its round green pods, not its dried beans. So, this rather rambling stream of misremembering and hearsay isn't terribly helpful to the seed saver with OCD (that's me, by the way) particularly since I've seen a bean listed called the Brittany bean that seems very similar (and equally untraceable) which could well be the same as Jersey is just a hack and spit over the waves from Brittany. 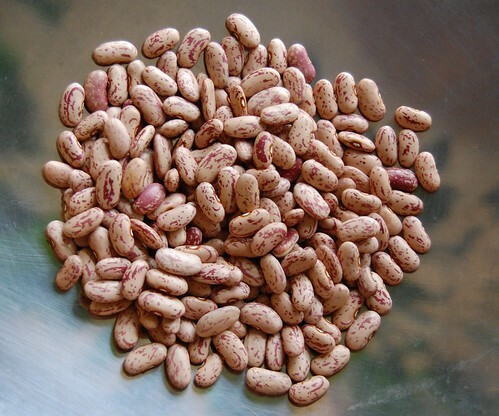 The beans themselves resemble any number of 'pinto' bean selections and don't seem distinctive enough for easy identification. All that aside the beans grew well for me last year, cropped reasonably heavily and now I've cooked some I can confirm they are mildly and pleasantly flavoured with a nice texture. Good beans by any name. The plants are dwarf haricot type, don't need support unless the weather is very windy and are pretty much a sow and forget crop with flat pods which are very lightly shaded with purplish red markings. This rather scrappy picture seems to be the only record I took of the growing plants. Now included in the seed swaps. Sorry I seem to be leaving comments all over your site! I am trying to find some seeds for Melonette Jaspee de Vendee but can not find a supplier, I wonder if you may know of anyone that stocks them? They have them at Kokopelli. Brilliant, thank you very much! I think I will need all the luck I can get as I have just got my first allotment - so exciting! What I meant to say was good luck with the allotment, tell us how it goes.